I can understand their free-market dogma, their despising of the poor, their indifference to disability or unemployment, their doctrinaire mantra of ‘private good, public bad’, their cosying up to oligarchs, and their heartless commitment to ‘profit-uber-alles’. I can understand their ‘Rule Britannia’ blimpishness, their visceral xenophobia, their yearnings for the return of a lost empire, and their warmongering lust for military adventure. I can understand their ambivalence towards civil liberties, their sadomascocistic desire for a ‘strong state’, and their paranoia about muslims, hippies, whistle-blowers, trade unionists, protestors, and anyone who appears to threaten the power or prestigue of the ruling class. I can even understand their strange attachment to the institutional flummery of the UK state, with its monarchical roots, ridiculous electoral system, its arcane unwritten ‘rules’ and its silly costumes. All of this makes sense, within their world-view and as seen from the interests of the thin upper stratum of society that they serve. I don’t like it, I don’t agree with it, but I can make sense of it. What I don’t understand, though, is this: what do Tories have against badgers? Alternative and more humane forms of controlling the badger population or of preventing the spread of bovine TB (of which badgers, apparently, are a carrier) are always dismissed. For the Tories it has to be shooting and gassing. It is almost as if they are acting out their fantasies for mass-murder. I feel a bit as if the way Tories treat badgers is how they’d treat Romanians, people with disabilities, and the long-term unemployed, if only they could get away with it. 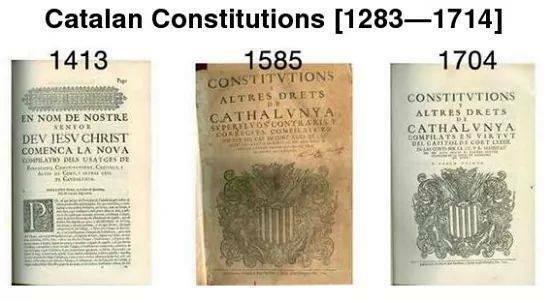 I don’t know enough about these Catalan documents to comment on their content or their historical importance, but for me what is most interesting about this image is the way in which early constitutional and proto-constitutional documents can be used as written repositories of ‘occulated statehood’. They maintain institutional traditions and public values while statehood itself is eclipsed – perhaps for centuries. As such, they become part of the rhetorical claim for the restoration of statehood, and they enable the case for statehood to be made in civic, democratic and constitutionalist terms, not merely nationalist ones. The Declaration of Arbroath performs a similar function in Scotland. The ‘3rd May’ Constitution served likewise in Poland during the era of partitions. According to game designer (and armchair philosopher) Jeff Dee, the reason so many computer games feature ‘Nazis, demons, robots and aliens’ as baddies is that ‘you can kill as many of them as you like without feeling bad.’ By selecting such loathesome enemies, the simple and cathartic enjoyment of virtually blowing stuff up with a great big gun need not be hindered by any ethical qualms or sympathies for the slain. Meanwhile, back in the real world, the UK government’s list of ‘those outside the compass of moral consideration’ appears to include muslims, immigrants, the poor, the homeless, people with disabilities, prisoners, and quite a few others besides. Indeed, given their enthusiasm for nukes, it appears to include just about everyone on the planet. Maybe someone should try to get David Cameron and George Osbourne hooked on playing Doom or Wolfenstein (I have not really played computer games since the 1990s, so my frame of reference might be a little dated). A bit of nazi-and-demon blasting would no doubt help them to give vent to their emotionally immature angst, loathing and frustration without actually harming human beings. This video intrigues and disturbs me. On the one hand, I generally find it encouraging to watch people being baptised. I don’t talk about it very much, but my own baptism was a very important turning point in my life. And why shouldn’t someone on active service, decide to repent and give themselves over to the work of the kingdom’s underground ‘rebel alliance’ instead of the empire? On the other hand, seeing this holy and symbolic act performed in a military context, with an AFV and folks milling about in uniform carrying guns, seems deeply incongruous. It normalises war, maybe even tries to sanctify it. And where is the line? If one can be baptised in combats, can one bless nuclear weapons? Whatever happened to the ‘peace testimony’? This video portrays the war as a sort of crusade, and makes the Prince of Peace into an All-American conquistador whose victory consists in the slaying of Moors. What is to be made of all this? I’m not condemning; I’m exploring the ambiguities, the contrasts and the dissonances. EU referendum: in, out, shake it all about? In 2016, UK citizens – of which I am one – will be asked to decide in a referendum whether the UK should leave or remain in the European Union (EU). The EU does a certain amount of good, and some sort of European level of co-ordination is probably necessary, but the EU in its current form is not an easy thing to like. Thanks to the Lisbon Treaty (a Treaty too far, in my view), the EU seems to be the main entry-point for oligarchy, a place shielded from democracy, accountable to no public, where the oligarchs’ plans to destroy all the social achievements of the twentieth century and send us all back to the slum, the sweatshop and the workhouse can be advanced without opposition. The EU also seems to continue to insist on a centralising project that is not content to be a loose confederation of co-operating democratic nations, but wants to build itself into a consolidated superstate, which is the antithesis of everything I believe in and stand for. Today, I read an article in the Independent, in which the EU Commissioner responsible for TTIP negotiations claimed to have no democratic responsibility to the peoples of Europe. The thing that grabbed my attention was the similarity between the argument for leaving the EU advanced in this article and my argument for Scotland leaving the UK: it’s not about identity, it’s about democracy. Now the Scottish independence movement and the anti-EU movement are, in general, very different creatures. Most people who want Scotland to leave the UK are motivated by progressive democratic ideas, by a desire to build a more humane, caring, solidaristic society, and by an inclusive, civic nationalism. Most of those who want the UK to leave the EU are motivated by reactionary ideas, by a desire to be rid of immigrants and pesky environmental regulations (they may get the latter wish under TTIP), and by an exclusive, backwards looking, imperial nationalism. To hear a non-racist, culturally ‘European’ argument for leaving the EU on democratic grounds is, at least, refreshing. The article wishes for a social, solidaristic Europe – but despairs of getting it, and sees leaving as an easier option than trying to change the EU from within. Similarly, if I felt that the UK could really be reconstituted as a democratic federation I wouldn’t necessarily be so committed to Scottish independence, and it is only because of the lack of opportunity for such change that Scottish independence appears to me as the best, easiest, safest option. Does this apply to the EU as well? I really don’t know what to do when the referendum comes. I will probably vote for staying in the EU, but only because, for now: (i) my fear of creeping undemocratic oligarchy in the EU is marginally less than my fear of what a crazy UK government without the restraining hand of the EU would do; and (ii) my fear of isolation if we are outside the EU is marginally greater than my fear of centralisation and imposed conformity (‘Gleischaltung‘, to give it its true name) within the EU. But it is a vote that I will cast reluctantly, making a forced choice between two Unions, neither of which satisfy my desire to live democratically and to enjoy what Maurizio Viroli describes as ‘the free and civic way of life’. Could be wise, and good, and whole. Scratched on walls where Saddam’s face had hung. Until the whole world is brought into foul submission. And prime ministerial statements of ‘deep sympathy’ and ‘sincere regret’. Once sent its knights and burghers – Deus vult! – joyously East. In a clash of civilisations, mostly peaceful, over blonde bier and baklava. To the oil-fires that outshine you. There’s nothing wrong, in itself, with being ‘pro-business’. When businesses produce useful goods and deliver useful services they thereby contribute to the common-weal. When they pay their staff well and treat them with decency, pay their taxes honestly, and gladly shoulder their social and environmental burdens, then businesses are certainly to be encouraged. In that sense, no-one with any sense would be anti-business. What folks like me are against – and what any party which is not simply a vehicle for the oligarchy should be against – is a model of business (and a model of business-state relations sustained by the policy decisions of the government) characterised by corrupt crony capitalism, low-wages, unethical business practices, short-termism, unproductive commodity speculation, asset-stripping, tax-dodging, deregulation, undermining of workers’ rights, disregard of social and environmental externalities, etc. What we are also against is using the term ‘pro-business’ as a cover for harmful austerity policies, the privatisation of public assets, the willful neglect of public services, the dismantling of social safety nets, and the selfish disavowal of any concept of mutual care, common responsibility, and shared prosperity. The Tories show their stripes once again, with a plan to cut disability benefit and ‘incentivise’ disabled people into work – work which in many cases will be low-paid and put an unnecessary toll and burden on them; and, more worrying yet, work that is simply not available. Leaving aside for a moment the ethical, moral and philosophical objections to Tory leadership’s big idea of turning Britain into a sort of giant open-air sweatshop and workhouse, let’s just look at this pragmatically from the point of view of ordinary Tory voters. Surely, if you are a typical Tory voter, you have a vested interest in having a social security system that looks after disabled people with a reasonable degree of dignity and comfort. But they don’t seem to act on that. Indeed, they seem to ignore the fact that disability can affect everyone. Do the think that disability just happens to other people – to the ‘feckless’ and the ‘scroungers’? Do they think that nice middle class people with good jobs don’t get illnesses, or have accidents, and end up unable to work? Don’t they realise that even someone who has a good job and savings will burn through that in a year if it all goes pear-shaped. Are they really that ignorant or that short-sighted? What’s lost in all this is the idea of social security as Mutual Insurance, rather than as a Transfer Payment. The beneficiary is not just the person who receives the payment, but also the one who pays in – and thereby receives security and peace of mind.